Broadcasting to you live from the top of the Harwich High Lighthouse. I’m here with my Amateur Radio buddy Jim 2E0RMI, at the top of this disused lighthouse. Jim’s set up a 2 metre rig with a pole sticking up out of the lighthouse, and he’s making some good contacts using the 2 metre band plus the Internet Amateur Radio service. It’s a windy old day up here, with some great views. 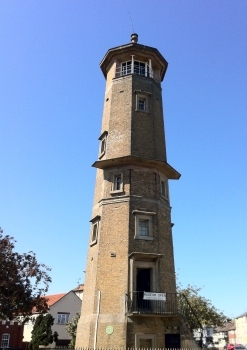 For information on the lighthouse, go to harwich.net/natwire.htm Good fun playing with radios and admiring the view, although it’s 100 steps down to the nearest loo, and there’s no coffee for miles.